Vrindavana and Mathura are the most important places of pilgrimage for devotees of Krishna. Krishna was born in Mathura and spent his childhood in Vrindavan. There are over 5,000 temples in Vrindavan. The city of Mathura, in Uttar Pradesh, the nucleus of Brajabhumi, is located 140 km south-east of Delhi and 60 km north-west of Agra. Covering an area of about 3,800 sq. 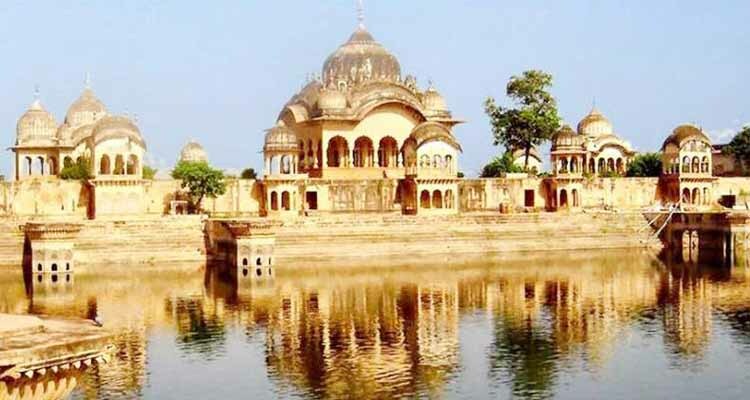 km., Brajabhumi can be divided into two distinct units – the eastern part in the trans-Yamuna tract with places like Gokul, Mahavan, Baldeo, Mat and Bajna and the western side of the Yamuna covering the Mathura region that encompasses Vrindavan, Govardhan, Kusum Sarovar, Barsana and Nandgaon (Nandagram). The land of Braj starts from Kotban near Hodel about 95 km from Delhi and ends at Runakuta which is known specially for its association with the poet Surdas, an ardent Krishna devotee. A long line of picturesque ghats – with their steps leading to the water’s edge, arched gateways and temple spires extending along the right bank of the River Yamuna, emphasize the sacred character of the town of Mathura. The birth place of Lord Krishna, Mathura is today an important place of pilgrimage. Lord Krishna is the most popular person here. Every square foot of Mathura-Vrindavan is wrapped in timeless devotion to Lord Krishna, the eternal hero, the lover of Radha and the cowherd-prince. Mathura without Lord Krishna is like Bethlehem without Jesus. Welcome to Brajabhumi, Krishna’s land. To enable everyone to see the area in a traditional spiritual way, every year in Kartika (Oct/Nov) ISKCON puts on a Braja Mandala parikrama. 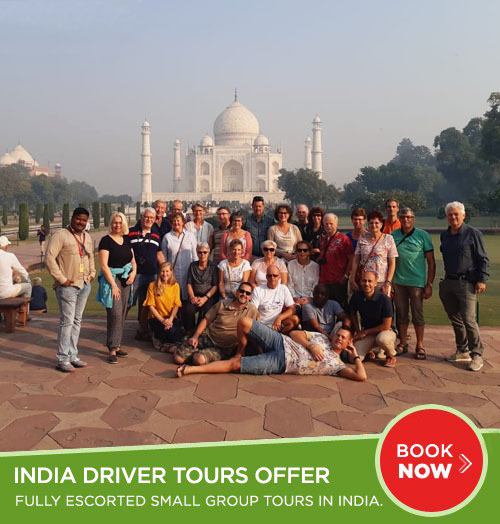 This one-month walking tour goes to all 12 forests in Vrindavan and visits most of major places in the Braja area including Mathura, Radha Kund, Varsana, Nandagrama, Gokula, Vrindavan, and Govardhana Hill. It is traditional to do this walk barefoot, although shoes are permitted. An ancient city whose origins fade into the mists of history, Mathura’s strategic location at the cross roads of various trade routes – that went westwards to West Asia and the Roman Empire; northwards, via Taxila, Pushkalavati and Purushapur to Central Asia and the Silk Route and eastwards to China – ensured its position as a center of trade and a meeting point for varied cultures. By the fifth century BC, during the time of Buddha, it was a major metropolis and the capital of the Surasena kingdom – one of the 16 Mahajanapadas of the period. Mathura saw its `golden age’ during the rule of the Kushanas and the able governance of rulers like Kanishka, Huvishka, and Vasishka, when the arts flourished and economic wealth grew. It remained a center of power during the Mauryan period, through the enlightened rule of Emperor Ashoka to the Gupta era (4th century AD). The climate of Mathura is extreme and tropical. Summers are extremely hot and winters are cold and foggy. It experiences southwestern monsoon rains from July to September. Akhand Jyoti Sansthan, Giya Mandi. Basantar Park. In memory of the victory of Basantar (1971 war). Dwarkadheesh Temple. Built in 1814, it is the main temple in the town. During the festive days of Holi, Janmashthami and Diwali it is decorated on a grandiose scale. Gayatri TapoBhumi (First Gayatri Temple), Vrindavan Road. Gita Mandir, (On the city outskirts). The temple carving and painting are a major attraction. Govardhan Giriraj Hill (Goverdhan Parvat). Government Museum, (At Dampier Park). Biggest and richest in Asia for Mathura and Gandhar sculpture. It has one of the finest collection of archaeological interest. Rare items from the Gupta and Kushan period (400BC-1200AD) are on display. Major attraction for tourists. Jaigurudeo Temple (also named Naam Yog Sadhna Mandir), . Constructed by gerat saints Baba Jaigurudeo. It resembles the Taj Mahal, built with white marble. It is a unique temple in that you are prohibited from donating if you are a non-vegeterian. Jama Masjid. Built by Abo-inNabir-Khan in 1661.A.D. the mosque has 4 lofty minarets, with bright colored plaster mosaic of which a few panels currently exist. Krishna Janma Bhoomi. There are two main places to visit in this complex. First is a prison cell where Vasudev and Devaki, parents of Sri Krishna were held captive. This place is on the left hand side of the main complex. This is the cell were Bhagwan Sri Krishna was born hence the most sacred place in world for all the followers of Bhagwan Sri Krishna. One cannot miss the spiritual and mystical power in the cell. After darsan here visit a magnificent temple. The idol of Sri Krishna and Radha are so beautiful and has a soothing effect on the devotees. I am sure any nonbeliever will also feel the magic. There are many other idols of gods here. Walls and ceiling are painted with some of the most important events in the life of Sri Krishna. One can climb up the stairs if authority allows to get a great view of idols. Bankey Bihari Temple (Bihari Ji Temple), Vrindavan. This is the most famous temple in Mathura and many people including VIPs from across India visit the temple every year. Mathura Jain Chorasi, (On NH-2). Worship place of Jains. Here is the largest statue of Lord Jambu Swami and is is made up of single piece of granite stone. This statue is about 21 feet in hight in sitting position of Lord Jambu Swami. Mathura Refinery. Watch the lightning in the evening. If you are coming from Agra in the evening you can enjoy this beautiful scene. Old Fort (Kans Quila), Near Swami Ghat. It’s the main Quila in Mathura to protect the city from Yamuna River. If this Quila was not built then it would have destroyed the city and it would will fill up with the waters of the Yamuna River during the flood time. Rifle Club of Mathura. One-of-a kind club. Expect rifle shooting now days. Shri Ganesh Temple (Siddhi vinayak), At Ganesh Tila (jaisingh pura,vindavan road). Shri Krishna Janm Bhoomi Temple. Birthplace of Lord Kirshna. Enjoy Satsung or Bhagvat-Katha here. Vishram Ghat. The sacred spot where Lord Krishna is believed to have rested after slaying the tyrant Kansa. Enjoy evening Yamuna ji ki Aarti here. Also see the river and huge turtles. Vrindavan, around 15 km from Mathura, is a little town and a major place of pilgrimage on the banks of Yamuna. Attracting about 500 000 pilgrims every year, mainly during major festivals like Janmashtami, Holi and Radhashtami, it is noted for its numerous temples, both old and modern, big and small (allegedly 5000 altogether). Vrindavan is synonymous with the childhood pastimes of Sri Krishna. Vrindavan is also the center for various Vaishava groups. In a centuries-old tradition Hindu widows have been coming to live out the rest of their lives in Vrindavan. They are expected to shed all physical adornments, including long hair, wear only white cotton saris and lead an austere lifestyle. In Vrindavan there are thousands of widows coming mostly from Bengal. They begin their day by bathing in the Yamuna and congregate at ashrams to sing bhajans (devotional songs). In return, they get a daily ration of rice and pulses and some cash. Subsisting on charitable donations made by wealthy traders, the widows pass their life in devotion to Krishna, the Supreme Lord. Vrindavan has an ancient past, associated with Hindu culture and history, and is an important Hindu pilgrimage site since long. The essence of Vrindavan was lost over time until the 16th century, when it was rediscovered by Chaitanya Mahaprabhu. In the year 1515, Chaitanya Mahaprabhu visited Vrindavana, with the purpose of locating the lost holy places associated with Lord Sri Krishna’s transcendent pastimes. Chaitanya wandered through the different sacred forests of Vrindavana in a spiritual trance of divine love. It was believed that by His divine spiritual power, He was able to locate all the important places of Krishna’s pastimes in and around Vrindavana. Mira Bai left the kingdom of Mewar and went on pilgrimages. In her last 14 years, Meera lived in a temple called Pracheen Meerabai in Vrindavan. Meera Bai is the most famous female Hindu spiritual poet, whose compositions are still popular throughout North India. In the last 250 years, the extensive forests of Vrindavan have been subjected to urbanization, first by local Rajas and in recent decades by apartment developers. The forest cover has been whittled away to only a few remaining spots, and the local wildlife, including peacocks, cows, monkeys and a variety of bird species has been virtually eliminated. A few peacocks are left in the city but monkeys and cows can be seen almost everywhere. Vrindavan is hot in summers, with day temperatures climbing to 45° C. Winters are comfortable, at an average of 32° C in the day and 14° C at night. Except for the monsoon months between July and September, the climate is dry. Light cottons in summer and monsoons, and light woollens in winter are sufficient. Weather conditions are the best from November till March. This period also coincides with the celebration of Holi in February-March every year. However, other major festivals, like the birth of Krishna and the birth of Radha fall in the month of August. This is an auspicious time for undertaking the chaurasi kos parikrama (circumambulation) or Ban Yatra around the holy sites in Braj Bhumi. And one of the best times to visit Vrindavan is in the months of July/August when Janmashtami is celebrated in full gaiety. Almost every day there is a festival in Vrindavan, but the major ones include Govardhan Puja, Guru Purnima, Holi, Govardhan Puja, Jhulan Yatra (swing festival), Janmashtami, Radhashtami and Basant Pancami. Entry into all temples is free, but have some coins handy for the shoe handlers. Many temples prohibit photography inside, so enquire when in doubt. Bihariji, The best-known temple in Vrindavan, home to a Krishna idol known as Thakur-ji. The idol’s eyes are said to be so powerful that it is kept hidden from view behind a curtain, which is opened and closed every few minutes. Govinda Dev Mandir. Built by Raja Sawai Man Singh of Jaipur in 1590, this squat, bulky temple reportedly had four stories lopped off during Aurangzeb’s reign of terror. These days it’s just infested by monkeys. Jaigurudeo Temple, also named “Naam Yog Sadhna Mandir”. It resembles the Tajmahal, built with white marble. It is a unique temple in that you are prohibited from donating if you are a non-vegeterian. 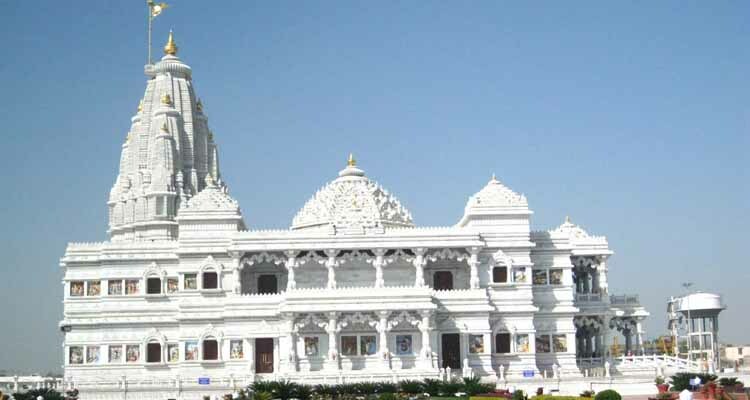 Krishna Balaram Mandir, better known as the ISKCON Temple, . A major draw for Hare Krishna (ISKCON) pilgrims to India, and uniquely among Vrindavan’s temples well equipped to deal with foreign visitors. Free breakfast and lunch are available. Great restaurant. Comfortable guesthouse on the Temple grounds. Kesi Ghat, by the Yamuna. According to the legend, this is where Krishna killed the demon Kesi and then bathed to celebrate. Aarti (prayer lamps) are offered to the Yamuna here every evening. Seva Kunj. Planted with countless tulsi (holy basil) trees, this is the garden where gopis dance for Krishna at night, and where Krishna and his lover Radha spend the night locked in the Moti Mahal. Rangji Mandir, the single largest temple in Vrindavan, built in 1851 in a South Indian style, complete with intricate seven-story gopuram (gateway) at the entrance. Inside is a 50-ft high wooden chariot, taken out yearly for festivals, and in the inner courtyard is the 50-ft high gold-plated pillar known as Dhwaja Stambha. Radhavallabh Mandir, a very wellknown ancient temple of Vrindavan, founded by Shri Hith Harivansh Mahaprabhu, Sri Radhavallabh Lal’s idol resemble Sri Radha and Sri Krishna to be embodied in it together- “One soul and two bodies”. Radharaman Mandir In Seva Kunj, see the Deity of Radharaman that self-manifested from a Shalagrama Shila (sacred stone). The nearest domestic airport is in Agra, 60-65 kilometres away from Mathura city, while the international airport is at a distance of 165 kilometres in New Delhi. You can easily get cabs from either of the airports, and the roads are good from both cities. Mathura being connected by both western and central railways, most of the major trains make a halt at Mathura railway junction. You can get public transport (cabs, auto-rickshaws) to reach the destination from train station. National and international highways connect Mathura to the major cities in the country. Luxury buses from Delhi and Agra, to Mathura are also available at great frequency. The roads are smooth and fun to drive on.